Big milestone! I've now hiked the Pinhoti Trail end-to-end, all 335 miles of it. It was so much fun that I want more. If that's not endorsement enough, let me spell it out: The Pinhoti is first class hiker trail. I highly recommend it as an extension of the Appalachian Trail, whether it is formally named part of the AT or not. I recommend that hikers who have the time, particularly early in the season, start their AT trek in, say, early February by hiking the Pinhoti. Consider it a warm-up. By the time you hit the AT in mid-late March, you'll be a seasoned veteran and already in shape. You'll have a distinct advantage over those nobo newbies and thru-hiker wannabes. But the Pinhoti is more than a preamble or a warm-up for the AT. It has a distinct personality of its own. It's far less traveled. It would be a shame to see it trampled the way the Georgia AT is. It has those quirky turkey track blazes, and it passes through some different ecosystems--particularly the distinctive, fire-dependent longleaf pine savanna. It's an Appalachian experience that the AT doesn't provide. On my completion day I hiked just five miles--the newly opened trail around Flagg Mountain. 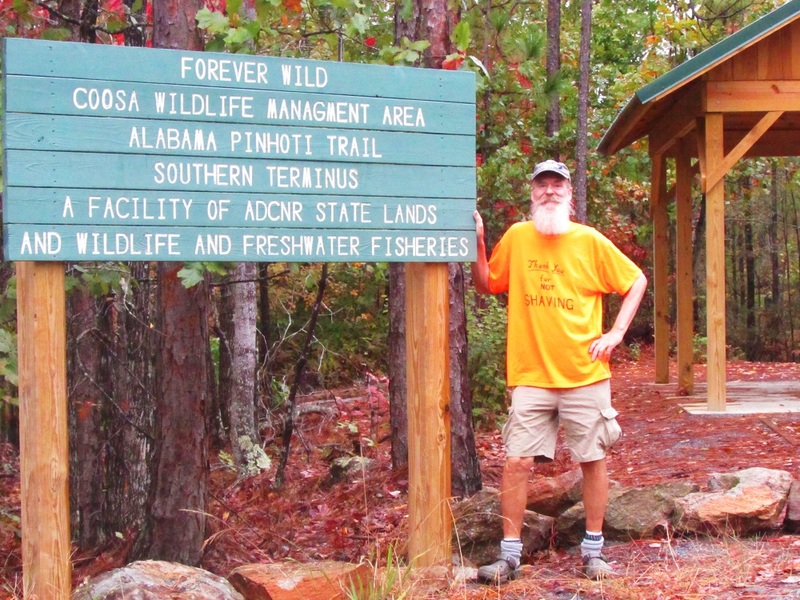 The land for this piece of trail was just purchased in 2011 by the State of Alabama through its 'Forever Wild' program. 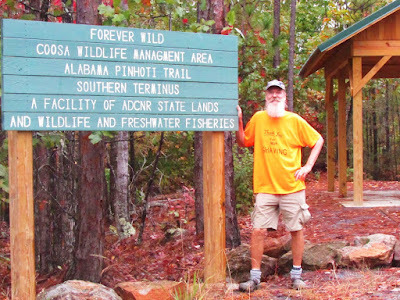 But the local hiker enthusiasts of the Alabama Hiking Trail Society have been a busy bunch. The trail is already up and running and open for business. The southern terminus trailhead has that big sign and a bigger pavilion, the edge of which can be seen in the photo above, and they've already established a primitive campsite and built a cute little shelter that sleeps two comfortably. The shelter register only dates back to May 2015. There were just six pages of entries. The entry before mine mentions hanging up an antlered deer skull over the door. They didn't mention the resident insect patrol, but he was on duty on the rainy day that I stopped in. Also along this five miles of trail I passed through a grove of Piedmont Rhododendron--first time I've been aware of this species, though I might have missed it because it's easy to mistake for the much more common Mountain Laurel. There was a short section of fine old rock work--this bit of trail must have been an old CCC trail. And I finally saw some real turkey tracks. Mind you, I saw dozens of wild turkeys, but it's been bone dry and tracks left in dust don't 'take' well and generally don't last long. I continued playing with shirts and hats. You've already seen the message on Shirt number twenty-one up top. Here's my message on Shirts number eighteen and nineteen. Eighteen was on display on Rebecca Mountain where the trail follows the last of the linear ridges. But on the following day the road walk down to Weogufka (north side of Flagg Mountain) found me walking beside a line of low hills, visible behind the shirt. The road walk also took me past a friendly horse, a disrespected witch, a diminutive yellow flower, a viney brilliant red one, and the first of the Great Eastern Trail yellow blazes that I've seen. So that was a bit of a picture show. I take lots of photos and generally post only a selected few here. The best of the rest of the crop can be seen by following the links on the map below. EveryTrail, don't fail me now!